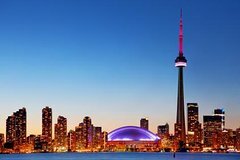 See the lights of Toronto on a one-hour evening sightseeing cruise on Toronto's Inner Harbour. While you cruise the Inner Harbour and its picturesque island lagoons, you'll watch as Toronto lights up for the evening in a fantastic light show. Your one-hour evening cruise is accompanied by a live commentary and soundtrack to set the mood. Evening cruises are seasonal and run from 7:00pm to 9:00pm, perfectly timed to combine with dinner and a night on the town in Toronto. This tour is seasonal, operating from June through to August.